I’ve been keeping my eye on the clintonia. For much of the year, these perennial lilies simply look like a pile of green, tongue-shaped leaves that sit unchanging on the forest floor. 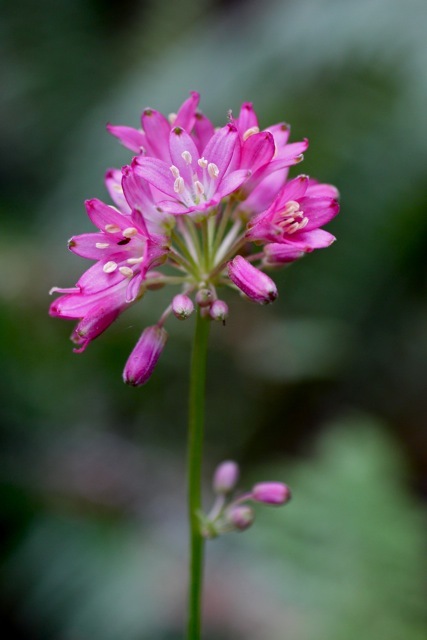 But in the springtime, they reward hikers with a dense cluster of brilliantly pink flowers atop a leafless stalk. There are masses of them along the Steep Ravine trail; when I was there a week ago the flowers looked just about ready to bloom–they are sure to be a lovely sight when they do. Later in the season, the flowers will be replaced by glossy blue-black berries that look like a stylized starburst, exploding from a single point on the end of slim pedicels. 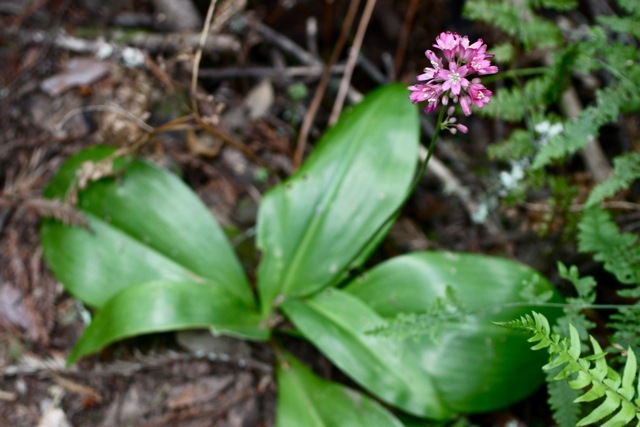 Red clintonia (Clintonia andrewsiana, also known as Andrew’s clintonia or blue-bead lily) generally grows under redwoods. Its range is restricted to the coast of Northern California, extending slightly into Oregon. Its berries are pretty but probably toxic–definitely don’t eat ’em. 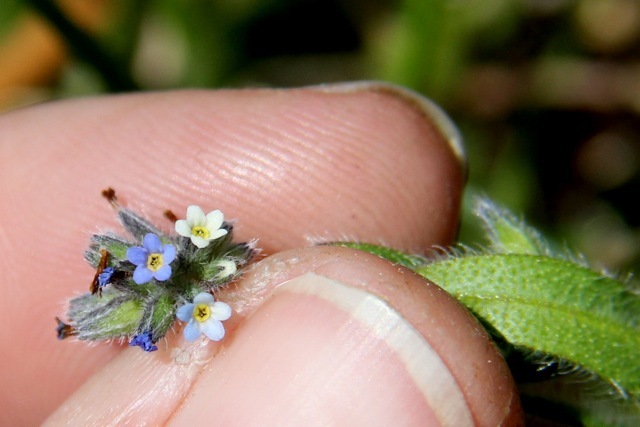 It’s easy to miss this teeny-tiny little forget-me-not (Myosotis discolor). Its flowers look just like those of its larger cousin–but they are just a millimeter across (sometimes as large as 3mm). They unfurl in a tiny, fuzzy curl and you have to look close to even see the color at all. They aren’t native–their homeland is Europe–but they aren’t particularly invasive either, and for some reason I find them delightful. Once you train your eye to spot them they are surprisingly common, thriving in moist coastal grasslands (though from the map, their range seems to include mountains as well). Look for this little plant in all coastal states on both the east and west coast. The Oregon anemone is a delicate little flower with many central stamens. 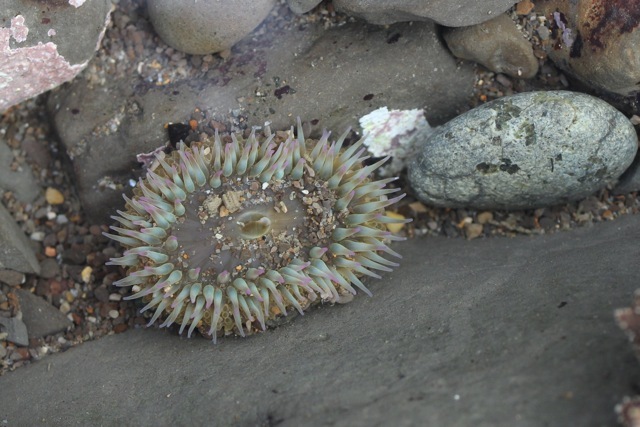 Like the sea creature it shares a name with, Anemone oregana does not have petals. Unlike the sea creature it does appear to have petals. But it’s a trick; actually those are sepals that, instead of being green and leafy are colorful, delicate, and–well–basically look like petals. These not-petals can be white, blue, or pink. The flowers grow in many-stemmed mounds of three-parted leaves. 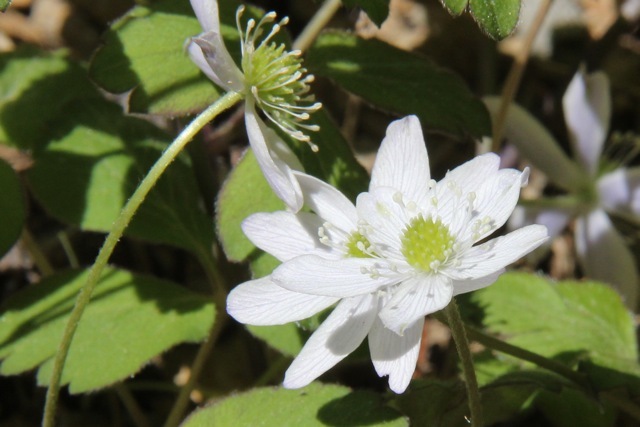 Oregon anemone (also known as blue windflower and western wood anemone) is generally found in moist canyonsides, often under redwoods. 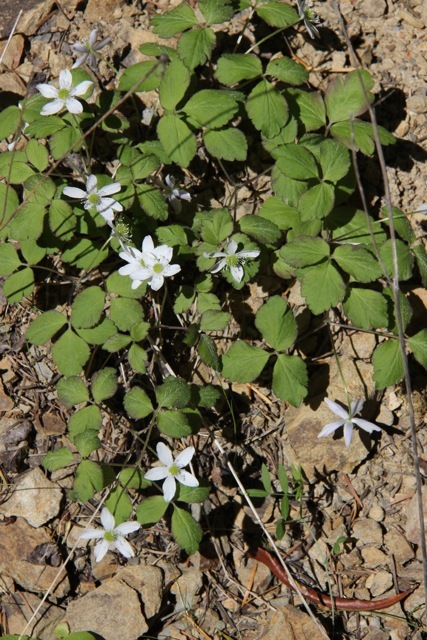 According to the Marin Flora, it has been spotted locally including in Mill Valley, Muir Woods, and Lagunitas canyon. I spotted the ones shown here up in Sonoma County. This pretty bloom can be found in the springtime from central California up into Washington. UPDATE: The flower shown here is actually Anemone grayii, which was recently split off from Anemone oregana. As far as I can tell, the easiest difference between the two to spot is that the peduncle (flower stalk) of the former is lightly to shaggily coated with little hairs, at least towards the top. It also doesn’t come in the pink form. If you really want to dive into the details, you can compare the descriptions of each in the Jepson database. Thanks to Doreen for pointing out the name/taxonomic change! A mass of pale flowers grows down the center of an old ranch road like a long narrow carpet. Walk onto this carpet and you see mound after mound of white flowers with yellow centers, growing atop a heap of pale, frilly leaves. 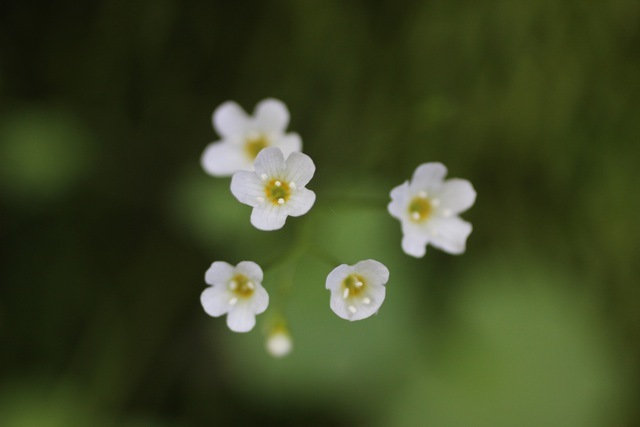 This is Douglas’ meadowfoam (Limnanthes douglasii ssp. douglasii); other subspecies are entirely white or entirely yellow. 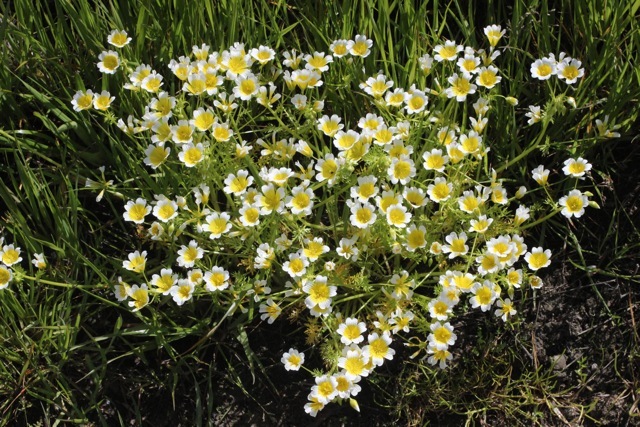 Douglas’ meadowfoam is native to California and Oregon, where it likes to grow in vernal pools, moist fields and meadows, or along the edges of seep springs. Often you can find it growing in great masses, such as in Chileno Valley or (according to the Marin Flora) near Phoenix Lake. 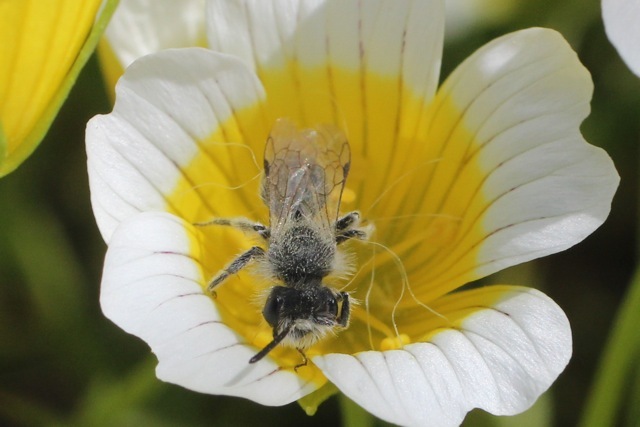 The yellow-and-white subspecies is by far the most common, and grows widely throughout northern and central California. The yellow is mainly found along the road to the Point Reyes Lighthouse, and only grows in Marin and San Mateo; the white is more widespread but still not as common. Also, keep your eyes peeled for the many other similar-looking species of meadowfoam that grow elsewhere in the state! 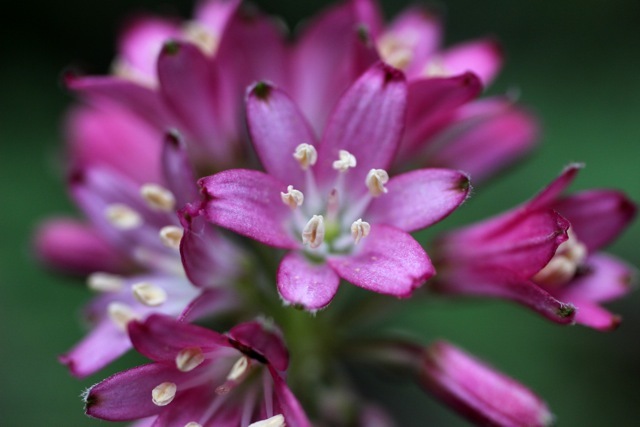 A single, brilliantly pink flower blooms atop a long slim stem. Each little petal is the color and shape of a valentines-day heart, with a second heart traced upon it in a line of dark fuschisa. Even more unusual, each flower looks like it’s emerging from a bulbous cocoon of papery bracts beneath. 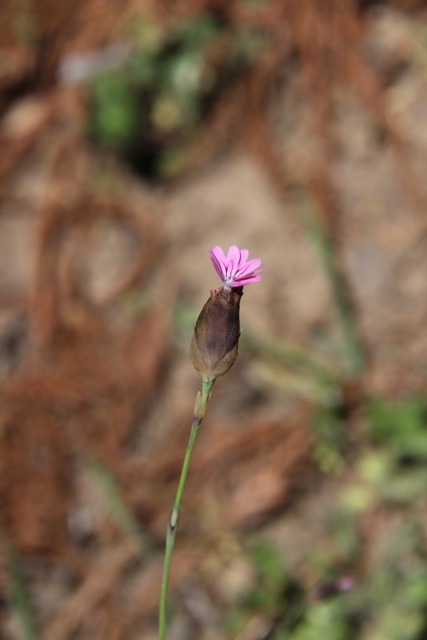 This is wild carnation (Petrorhagia dubia), also known as windmill pink. Just like storebought carnations, this flower is in the Caryophyllaceae–or carnation–family. A good trick to tell that you’re looking at a species in this family is that the stem swells noticeably at the node where it joins the paired, linear leaves. Knowing the key diagnostic features of families, like this, is a good trick to have up your sleeve when you’re trying to key out a new plant! Some, like this one, are much easier than others. 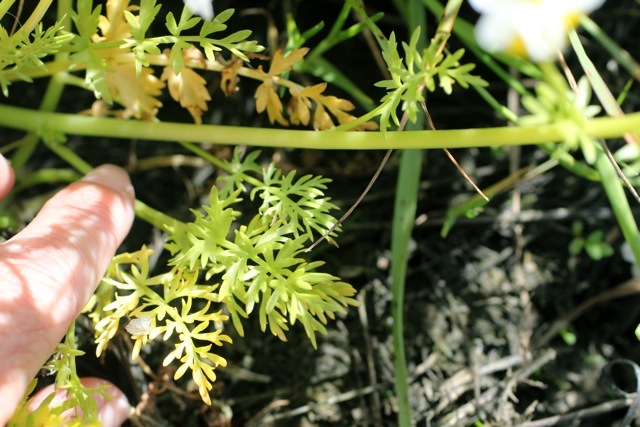 Sadly, this striking plant isn’t native–you’ll see it growing in fields, roadsides and other disturbed habitats. It’s not all about the flora out there in the great wide open. Here are some pictures of the great critters I’ve seen since starting this blog! If it looks like a saxifrage and it grows like a saxifrage, then it’s a saxifrage… right? Well, no. Not in the case of mist maidens (Romanzoffia californica). The delicate spray of white flowers rises on long bare stalks from a rosette of scalloped leaves… which is the characteristic growth pattern of the Saxifragaceae. 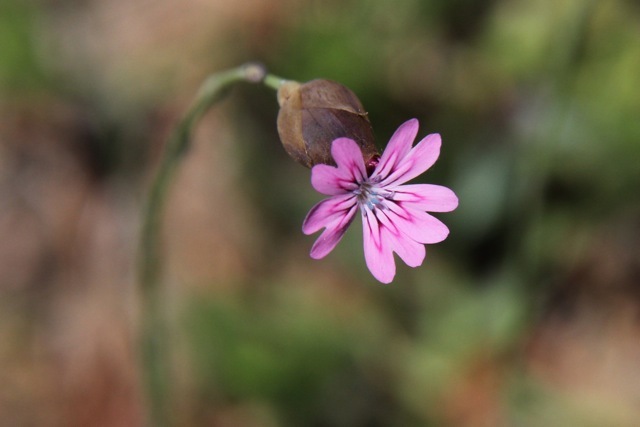 But this little moisture-loving plant is actually in the Boraginaceae family, along with forget-me-nots and fiddlenecks. Mist maidens are found in shaded forests and moist, rocky slopes in Oregon and northern California. You’ll almost always see them in wetlands (or wet-hills? ); the Marin Flora reports that they are especially spectacular on the Tomales Bluffs, where great masses of them grow. This little vetch is in full bloom right now; you can see it everywhere. Low twining vines sport one to three magenta flowers, nestled among feathery leaves. 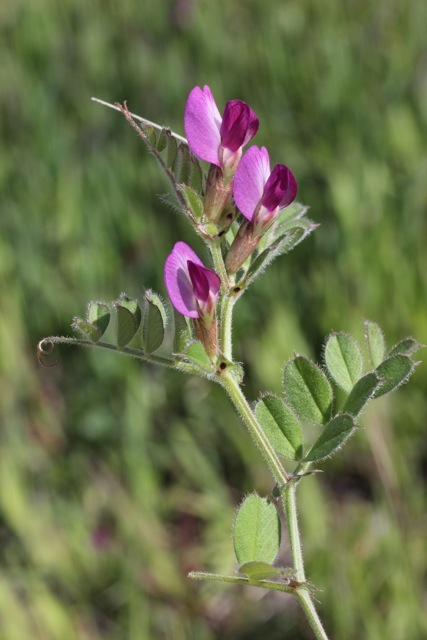 Spring vetch (Vicia sativa) is a nitrogen fixer in the pea family that was introduced to the US from Europe and North Africa. The leaves, seeds, shoots and pods are all edible; according to Wikipedia, evidence from Neolithic sites in the Middle East suggest it was a part of the local diet of the time. It has also been reported from predynastic sites of ancient Egypt and several Bronze Age sites in Turkmenia and Slovakia. However, definite evidence for later vetch cultivation is available only for Roman times. If you trust Wikipedia, that is. It is also known as garden vetch and common vetch. The petals of fringe cups (Tellima grandiflora) look like they have been trimmed back into a geometric design, like a paper snowflake. The flowers of this common and lovely little blossom grow in a densely packed spike, and can be greenish-white or pale red. They tend to grow in shady forest, where the slightly translucent petals catch the light beautifully. 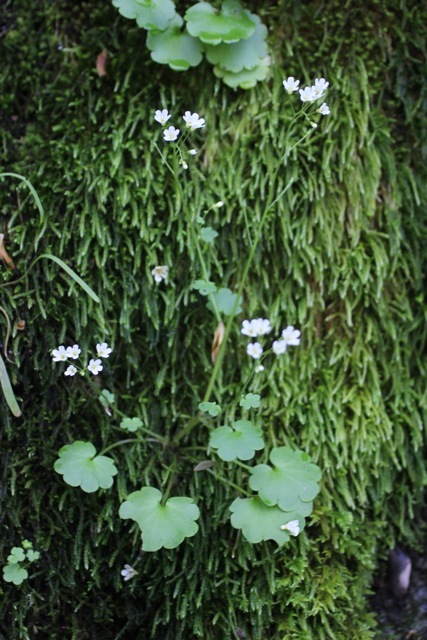 Fringe cups grow on moist, rocky slopes and in shaded forest across the west, from California to BC and Alaska. Spotting a phacelia always makes me want to break into song: oh Phacelia, you’re breakin’ my heart… you’re shaking my confidence daily. I love these little members of the waterleaf family; often they have caterpillar-like, curlicue inflorescences that slowly unfurl as the blooms mature. Divaricate phacelia doesn’t curl like some in the genus do, but it’s a very pretty little flower. Five-petalled blue blossoms grow in small clumps atop soft green stems. Though not particularly common in Marin, it can be abundant in patches like one I stumbled into on a serpentine outcrop on Mount Tam. It also can put on showy displays after a fire burns through chaparral, according to the Marin Flora. This flowers’ blossoms are as pretty as its names are dull: it’s dubbed either annual blue phacelia or divaricate phacelia (a not-so-inventive inversion of the scientific name Phacelia divaricata). It is only found in central California.